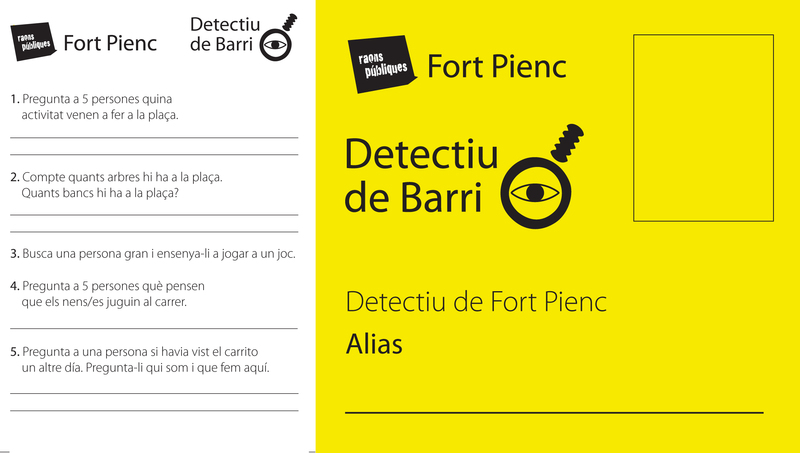 Official Public Space Trading Cards of Fort Pienc! Check out the Public Space Index for pages on individual public spaces in the Fort Pienc neighborhood. Saturday morning with El Carrito decked out with the spring display structure and all 24 Official Playing Cards on board. As my time here in Barcelona, with the good people of Fort Pienc, with Raons Publiques and of course with El Carrito, draws to an end, many exciting things are going forward. The trading cards (click here to view all) are ready to be traded, collected or who knows by the neighborhood children… time and summer will tell. The Observation Space Journal – an internal Raons Project – has officially begun with the first evaluation of observations, sketches, space musings and finding this Monday. 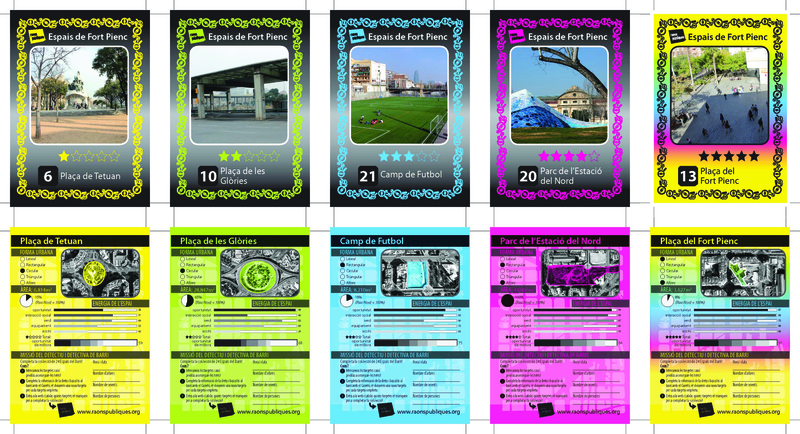 Spaces can be browsed in the Fort Pienc Public Space Index. 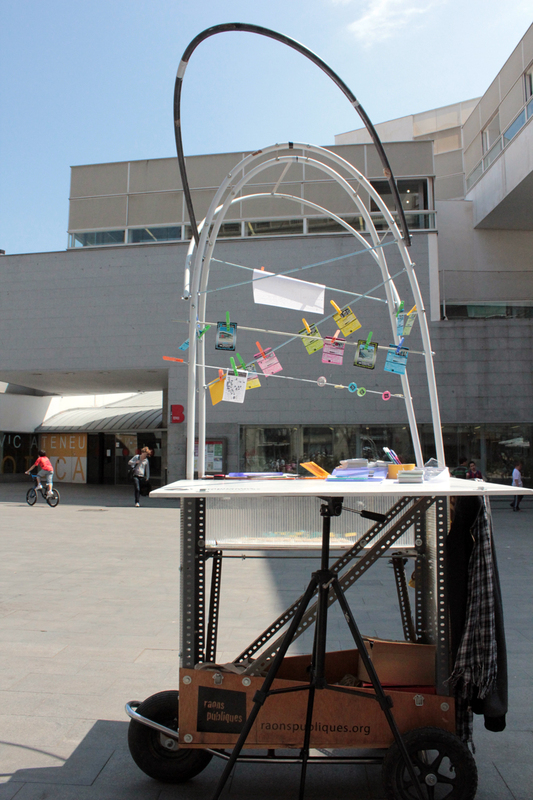 This has been a wonderful beginning in exploring the relationship between Participation and Public Space…. The journey will continue on MIT’s CoLabRadio… Enjoy! In order to engage the greatest variety of users, we have to put into practice a variety of activities; if we simply appeal to “everyone in general” we are simply approaching participation in bulk, which fails to engage. And so, we are working on developing specific activities for specific users. The process is slow; as we are getting to know the different users in the neighborhood, we think of different activities that can work. 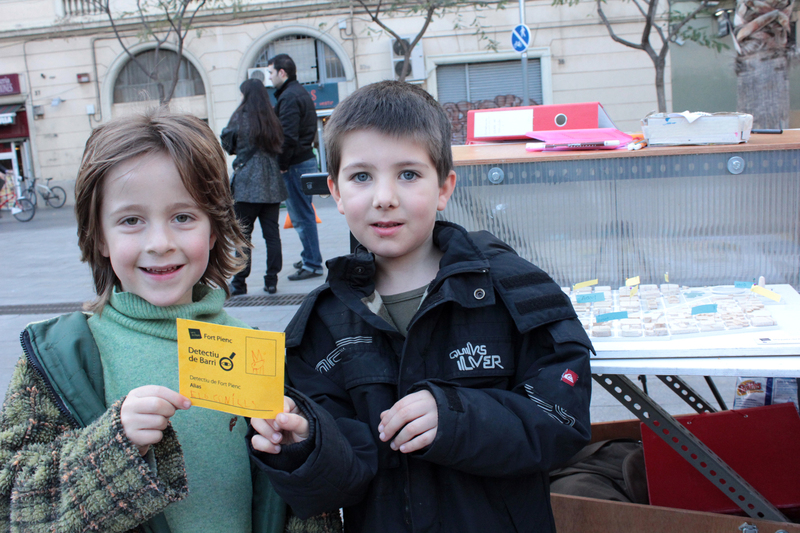 On Thursday afternoon, we officially launched the Public Space Trading Cards. 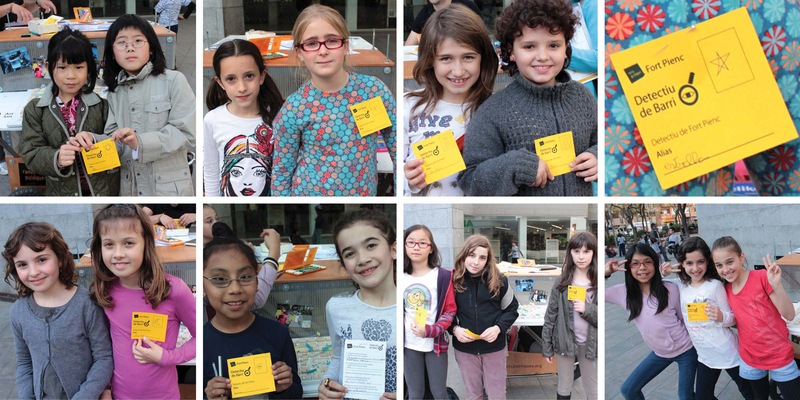 Inspired by the game of Detectiu de Barri (Neighborhood Detectives), which challenges children to an urban mission, we wanted to offer a prize after each participant or group answered the 5 Urban Mission Questions. 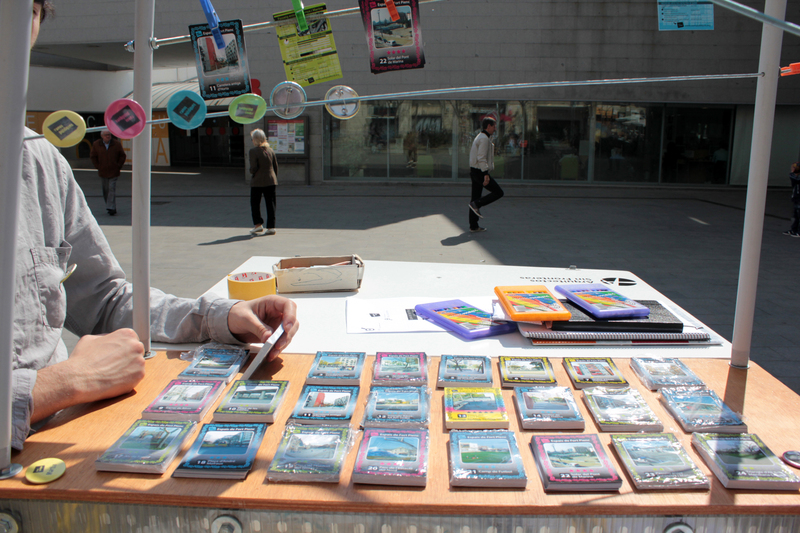 After seeing some of the children play with other trading cards, such as futbol (soccer), the idea of Public Space Trading Cards began to take root; but instead of just trading, children are encouraged to complete information about each space on the back of the card (1. How many trees? ; 2. How many benches? ; and 3. How many people are in Space X?) in order to earn more cards. In fact, we met with a school officially to ask his opinion, and it struck me as funny that he remarked on the strangeness of giving away the cards for “free;” of course, they are not quite free: they must be earned with some urban exploration, and not the dominant currency. We had some enthusiastic participants; however, before we knew it, the time came for the second activity of the day. The Civic Center Fort Pienc hosts various dance classes, including American Country! In our continued efforts to get to know the neighborhood better, we saw this as a great opportunity to use activities already occurring in Fort Pienc and infuse them with an urban twist. And so, rolling out the red carpet complete with a neighborhood map, El Carrito to the side and some Raons members joining and participating in the festivities, the Country Dancers of Fort Pienc draw quite a crowd. It is also a great opportunity for some Raons members to walk around and informally talk to the observers and ask them what other types of activities they would like to see in their neighborhood. This looks quite beautiful from above! Country Dancers in Fort Pienc... on Fort Pienc! Of course, despite the music and the general focus on the dancing, it is good to remember that not everyone will use the space in the same way; as I went to the library terrace to take photos, I noticed that the first floor of the library was full (like usual) with mostly senior men with newspapers in hand. 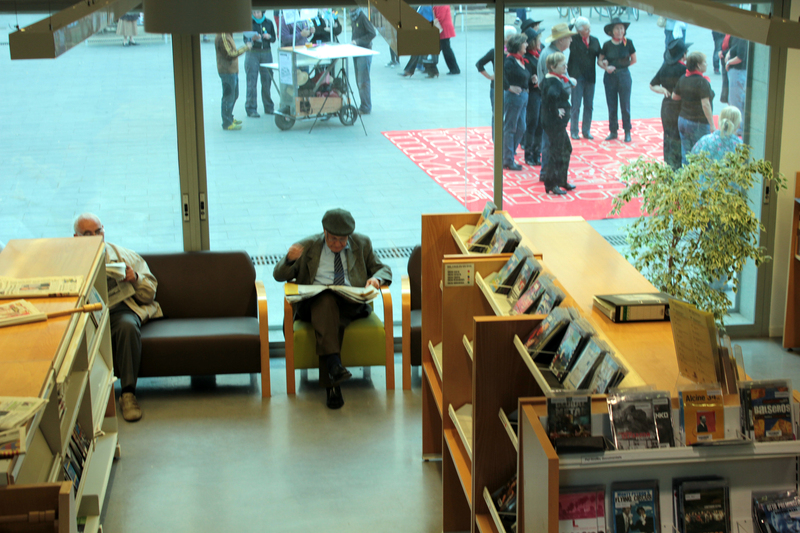 You can see the country dancers through the window, just outside the reading room. 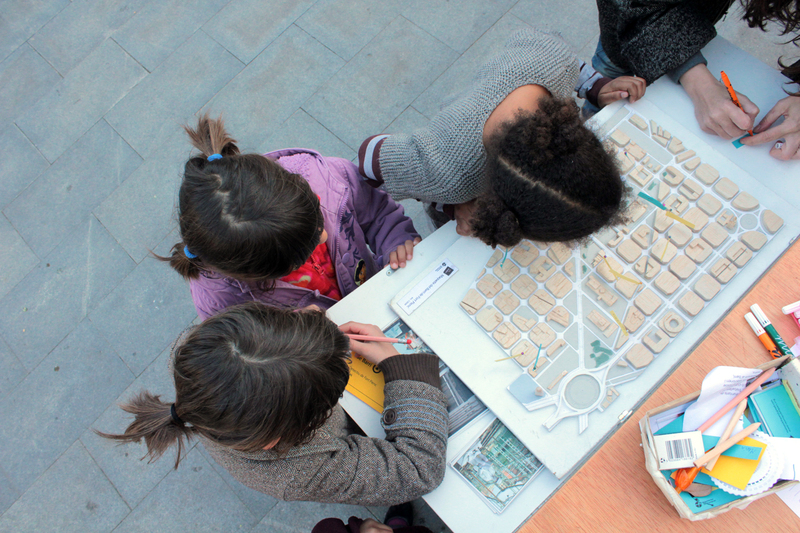 In addition to the model of the neighborhood, the maps and survey sheets, Raons is aware that participation at its best is pluralistic; therefore we need a wide array of tools in order to engage community members representative of the existing diversity. The process is necessarily slow since we are learning about them, just as they learn about us. More than ever, today I wished that my Spanish skills had increased to a good enough level to understand all the subtleties of the dialogue between Raons members and Manuel Delgado Ruiz, Professor of Religious Anthropology at the Departament d’Antropologia Social at the Universitat de Barcelona and Coordinator for the Doctoral Programme in Anthropology of Space and Territory and its Research Group on Public Spaces. 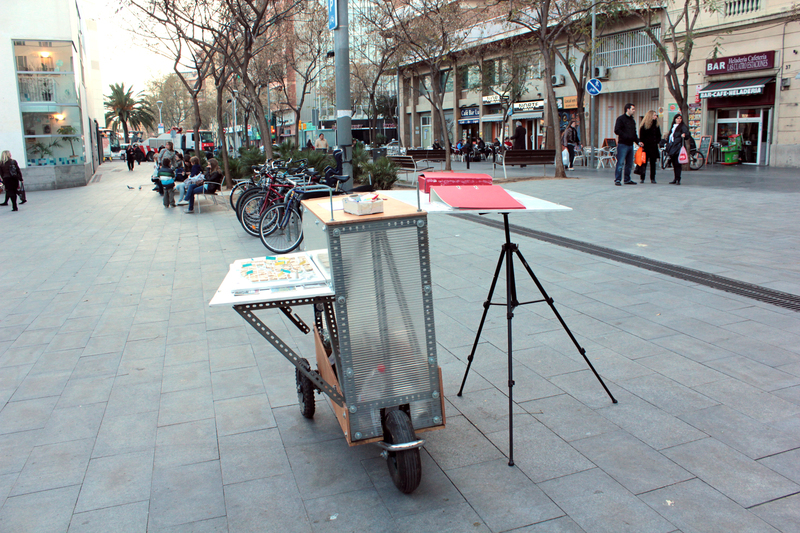 If your Spanish isn’t lacking, you can watch this engaging lecture on Public Space As a Space of and for Communication. Certain things are clear, however, and that is that the idea of democratic public space is still elusive in understanding and practice. One of the reasons for this, according to my interpretation, is that people have an idealized and nostalgic image of public space; this vision is at odds with reality (which is messy and complex), and thereby proves unproductive as a point of departure for dialogue. Essentially, people have a sudden and often defensive reaction to imminent change; the nostalgic image of how good things used to be is a defense mechanism that has its merits for coping with change and challenging change, however, it does not always facilitate a democratic exchange of ideas. ( I will update this post as soon as I get any translations of his work.) Along the same lines, I recently read an article about NIMBYism (Not In My Back Yard – a widespread view antagonistic to development widespread in the United States, among other places), in which Matthew Kiefer suggests that among all the complex opponents to change, the common denominator is that “NIMBYists resist change imposed by others.” This is an important distinction, especially in light of what we are trying to do with participation that comes before not after a project is decided upon, designed and practically in the construction phase. Today was one of the most continuously busy days at El Carrito. Once the elementary school let out for the day at five in the afternoon, we had an almost continuous string of young students excited to complete the Neighborhood Detective missions. First, we use the site model to facilitate orientation within the neighborhood through the recognition of the neighborhood landmarks such as the Arc de Triomf, the North Station and the Monumental Torro Stadium. 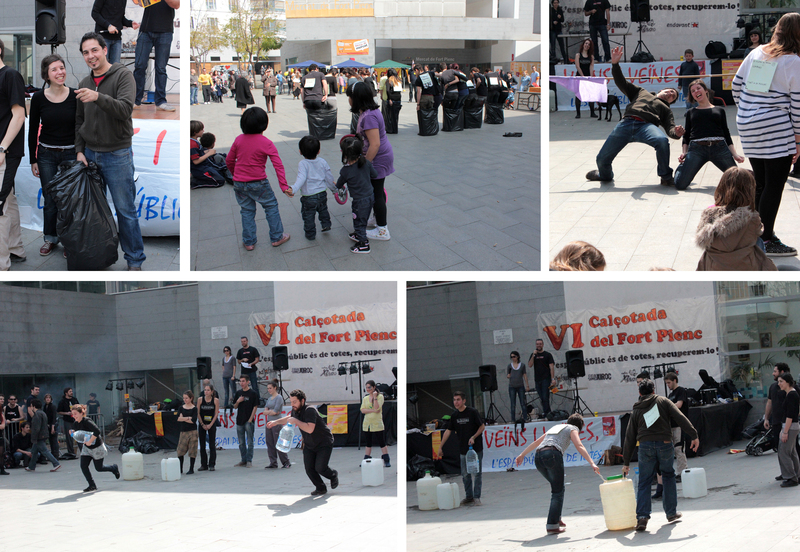 Then Javi and I explain that there is a mission – an urban mission – to be completed. Before disclosing the mission, each Neighborhood Detective group must create a fake name – the Alias. Names have included: Corazones, Estella and Superman. Each group member writes this alias down and executes a portrait drawing depicting the name to create the official badge to wear on the mission. 1. Ask five people what activity brings each to the plaza. 2. Count the number of trees and benches in the plaza. 3. Engage an elderly person in a game. 4. Ask five people what they think about children playing in the street. 5. Ask one person if they have seen El Carrito before and how they would describe its activities. 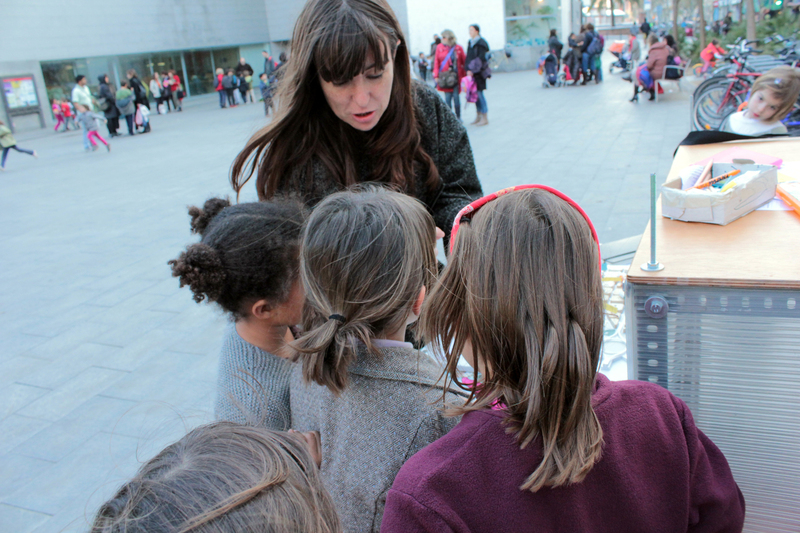 The individual questions are designed to encourage children to explore the plaza and enter into dialogue with the people who use it. We hope to facilitate investigations of both the social and spatial qualities of the plaza. After the mission, each team poses for an official photo, of which they will receive a copy the following week. (We had four previous teams pick up their prints today.) 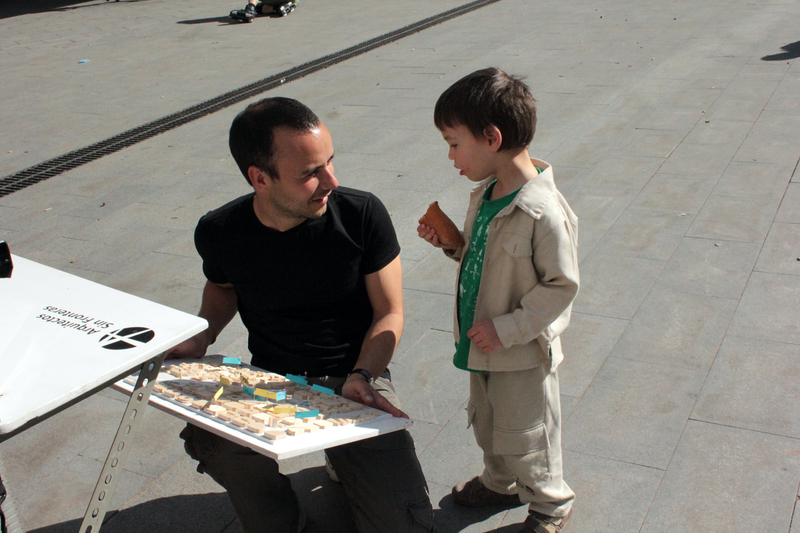 Each team member also receives a small prize –Arquitectos Sin Fronteras postcards. Soon we hope to replace this with our Public Space Trading Cards – which is in the works. 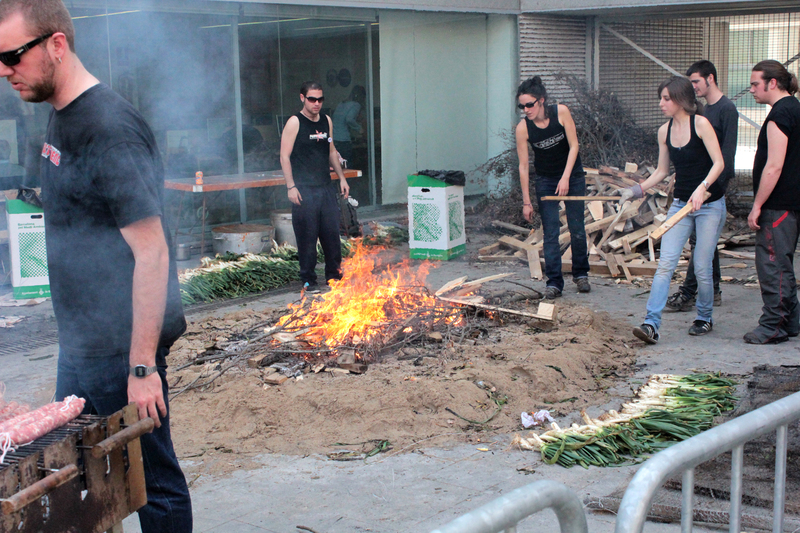 On Saturday morning at the Plaza ort Pienc, the members and participants of Espai Jove (The Young People’s Space, Eixample District Association) hosted a festival and Calçotada (a barbeque of a green onion like vegetable called the Calçots traditional in Catalunya). Upon arriving to the plaza with El Carrito, we saw the banner of “I ‘heart’ Fort Pienc” hanging from the trees. Turning towards the library building, another banner hung, presumably by the Espai Jove members, with a remark that loosely translate as “go to s…t” taking a stab at humor and politics. While a Calçotada provokes expectations of music, food and people, politics had an unexpectedly large presence. 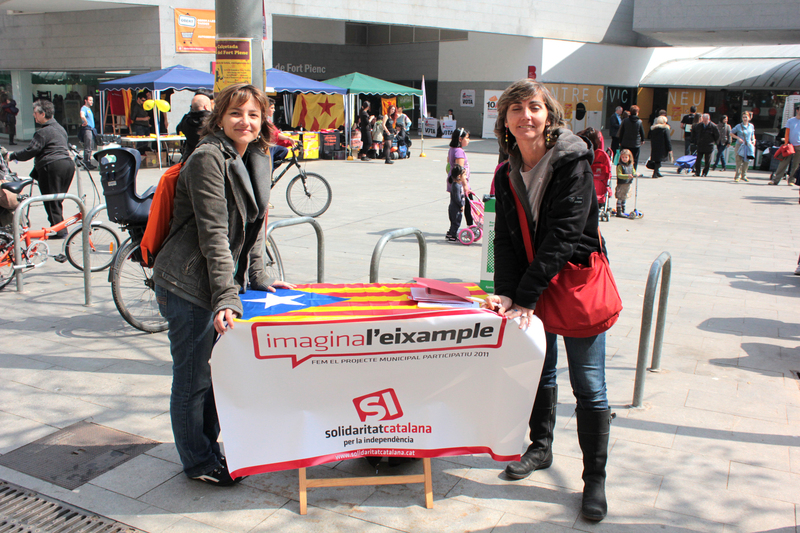 I noticed another political group, Solidaritat Catalana, when one of the three members asked me to take a photo of them at their booth – a fold up table with a banner in front and a flag of Catalunya as a table cloth on top. To my surprise, they also sought resident participation! After a few minutes back at El Carrito, I wanted to return to ask more information about their objectives and process, but they had (to my surprise, once more), already left. While I understand the objective of Barcelona Decideix, the latter political faction seems dubious in their proclaimed interest in resident participation that seems to have amounted to little more than a photo of the members. While I cannot understand the subtle motivations behind this political party, participation can easily be used as a tool towards self-aggrandizement instead of as a platform of listening to the real voices and needs of residents. Caught up pondering politics, participation and motivation, I decided to turn once more to the happier thoughts of the Calçotada festivities on hand. At just before eleven in the morning, the plaza was full of activity. The youth members prepared for the festivities. The elderly observed them filling large containers of water at the fountain; parents with their children played and talked. It was also a sunny day. 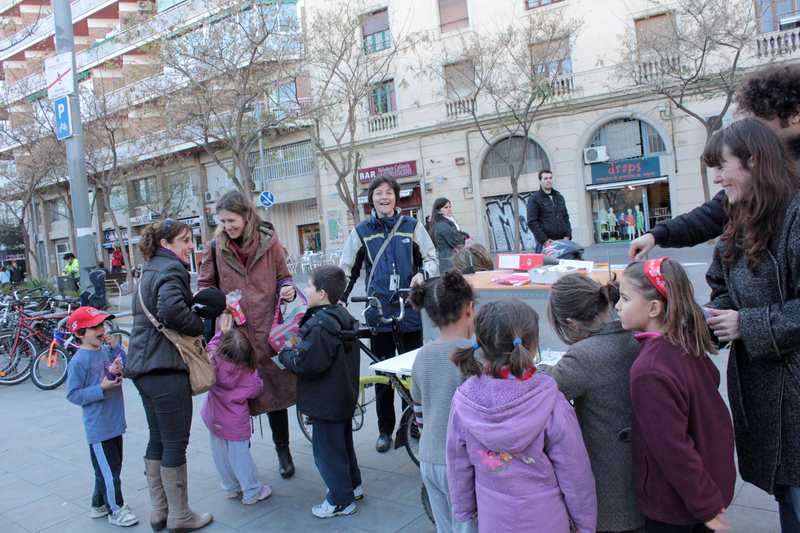 We set up El Carrito along Ribes Street to engage the residents strolling through the plaza. However, once the festivities began, El Carrito received little attention. Although this Thursday afternoon was somewhat of a waiting game, we did have two new Neighborhood Detective teams that included six children and drew some of their parents to El Carrito as well. 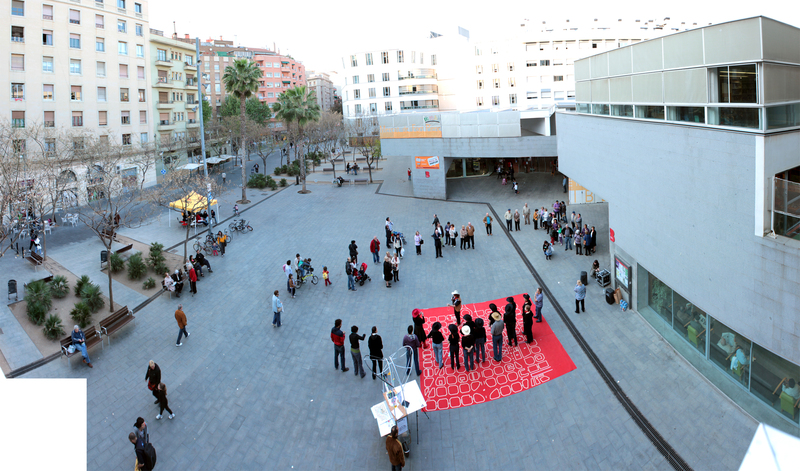 It is generally agreed that public space is democratic space – in other words, it is open to all people. Similarly, public participation capitalizes on this multi-opined presence to gather wide-ranging input about an issue of concern. 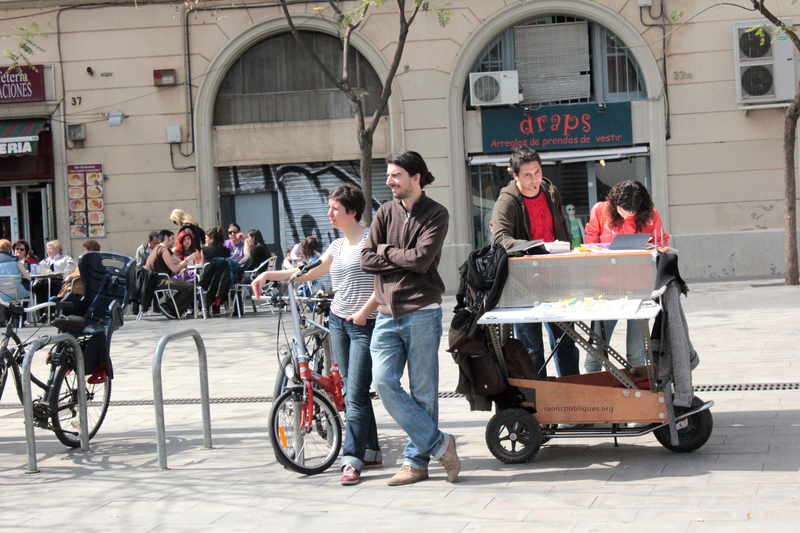 In our case: How do Fort Pienc residents use the public spaces in their neighborhood? Conceivably, then we (as planners, designers and catalysts for inclusive city development) can synthesize citizen contribution towards the achievement of projects for the public good. Regarding the use of public participation towards the improvement of public space, Carlos had the following conversation with two residents at two different times regarding the Civic Center Plaza. As some background information, three cafes, a market, the library, senior-citizen housing and the elementary school all open onto the plaza. Resident 1 remarks that the elementary school takes priority over the other uses in the plaza. Since all the recreational outdoor spaces of the school are contained within a relatively small footprint, portions of the public plaza should be given over for school use. Furthermore, he remarks that the school lacks sufficient green space like other playgrounds in the neighborhood, such as the Elementary School Ramon Llull. 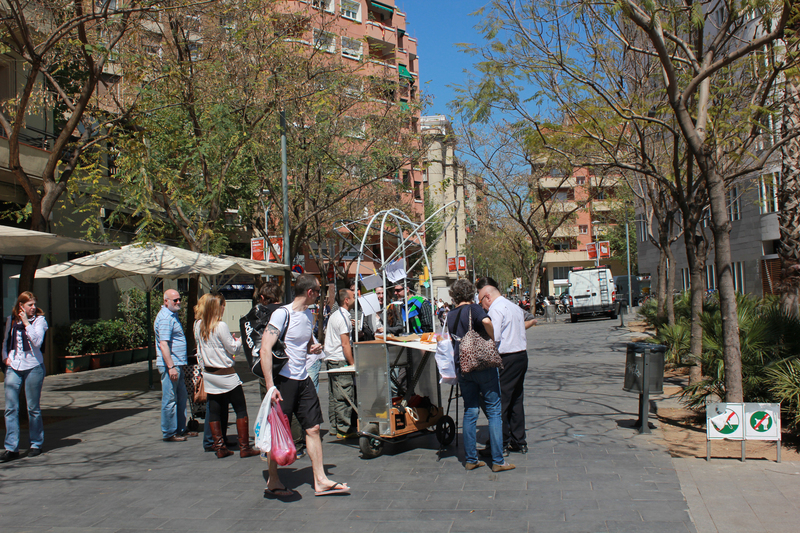 Resident 2 proclaimed that the residents around the plaza are some of the luckiest in Barcelona because their public space contains so many activities beneficial for daily life. He also noted that his children, who attend the school, are more than happy with their recreational spaces. On what experience and knowledge are these perceptions and opinions founded? Do the residents’ different perceptions of space and use, hinder or enrich participation processes? After all the excitement, El Carrito patiently awaits further activity.